My review copy: Review copy provided by the publisher via KISMET Blog Touring in exchange for an honest review. Not feeding a zombie isn't like not feeding your cat. He. Will. Eat. You. And your cat. People who forget to pick up a case of Ghoul-AID sometimes don't live to regret it. Capisce? "Your task will be great, daughter. And at times, the burden of your gift will be heavy. I have looked into your heart and judged you worthy. You are a child of Anubis, chosen for my gifts. Are you willing to accept my bidding?" You will be afraid. That fear will sit like a cold, dark lump in your stomach, and it will grow tentacles and clutch at you heart and your brain, and choke your thoughts and emotions until all that exists is pain and exhaustion and terror. My advice? Embrace it. 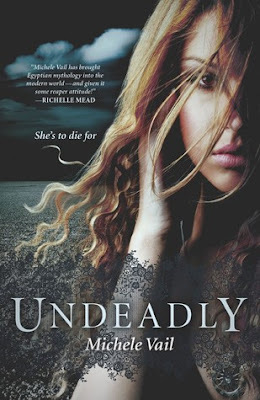 Fast paced, entertaining and frequently silly, Undeadly is a decent paranormal romance that will appeal to fans of the House Of Night series. While not breathtakingly original, it's a readable story that offers something you don't see in the YA genre too often - Egyptian lore and necromancy. And for that reason alone it's a story worth checking out! Molly Bartolucci is a necromancer. She was born with the ability to raise and control zombies. She's not particularly fond of her talent. She'd much rather live a normal teenage life, hanging out with her friends and dating Rick. Unfortunately for Molly, that scenario is out of question. And not only because her soon-to-be-boyfriend dies on the night of her sixteenth birthday, but also - or perhaps most of all - because Anubis chose her to be one of his reapers. And not just any reaper, either, but the only living reaper with the power to defeat evil. "Crap. That test was awful with a side of lame. Why hadn't I said something less sucky? Argh!" "I mean, I'd done something impossible to save Rick. And then I'd passed out. 'Cause I know how to par-tay. Ugh." "Huh. Anubis was cute. Not my type at all, though. In fact I felt a little repelled. Probably because he was a god and all." I mean, I can only swallow so many UGHs and ARGHS and HEL-LOs before I start gagging. Thankfully, the plot line of Undeadly was better than its lead heroine. The overall set-up of the story is in many ways similar to the Vampire Academy series (Molly discovers that she possesses some very special powers/abilities, she's shipped off to Nekyia Academy where she is then tutored by an arrogant and seemingly unattainable hottie). The similarities are hard to miss, but they didn't bother me all that much. It's the unique premise that really made this book for me. I can't tell you how excited I was to read a book based around Egyptian mythology! That alone was a big redeeming quality for me. I also found it quite interesting to read about zombies, necromancers and reapers, though at the same time I wished those themes were more thoroughly explored. One aspect of the story was especially interesting and that's zombifying your dead relatives and having them work for you or serve you. I thought that was a fascinating idea that could inspire some philosophical musings on life, death and free will. Sadly, the more meaningful and stimulating side of the story was not explored at all. I did, however, had a lot of fun following the plot line. I liked how fast paced and action packed the story was, and - once I got past the annoying heroine - I enjoyed myself quite a lot. In the end, despite its many shortcomings, Undeadly proved to be a good read. While I can't say that it blew me away, I'm certainly interested in finding out what will happen next. And hopefully, in the next instalment of The Reaper Diaries we will see some character growth in Molly. Fingers crossed! I've been so curious about this one! I'm looking forward to reading it. Great tour! Well, CRAP! I am so very disappointed that you didn't like this book better. I have been really excited about this book. Very excited. Maybe the cover has a little to do with that. I mean, it is pretty awesome! It is incredibly frustrating when the lead character is a let down. I think I will still read this one one day, but I think I will wait for the library to get it in. Thanks for the review! This one is on my TBR list and I will probably still read it but I am glad to know your opinion. Thanks. I'm glad that you enjoyed this book enough even with Molly being an annoying character. I didn't like this book very much and was actually mad that I forced myself to finish it. That's 2 nights of reading I could have spent on something more enjoyable. Besides Molly making me want to jump off a cliff or something, I just wasn't that into the story.